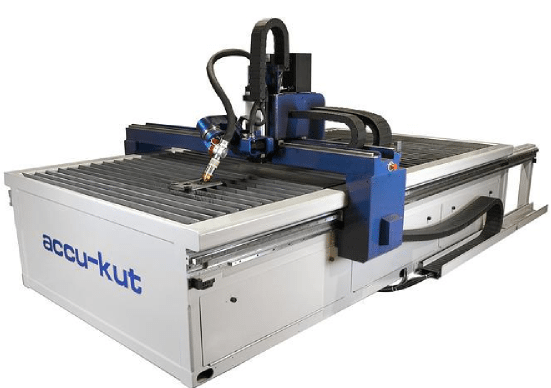 The AKS Cutting Systems “tru-kut” is a 5’ x 10’ platform CNC Plasma Cutting System that includes many of the preferred features of the AKS “accu-kut”. The AKS “tru-kut” is a CNC x-y programmable plasma cutting system that can incorporate either traditional non-HyDefinition® “air” plasma power supply unit, or upgraded to the AKS “tru-kut” X to include Hypertherm “HyDefinition®” plasma cutting. The dura-kut is manufactured to machine tool standards and is built for maximum precision, repeatability, flexibility, durability and longevity. Using the latest precision drive systems for high-speed, high-accuracy, heavy-duty plasma cutting. The accu-kut combines Hypertherm SureCut™ plasma technology with a century of machine-building experience. Built to the highest machine tool standards and made in the USA like all AKS products.